Update: This is the new HTC Desire 12s and has been launched officially in Taiwan and is available for purchase. 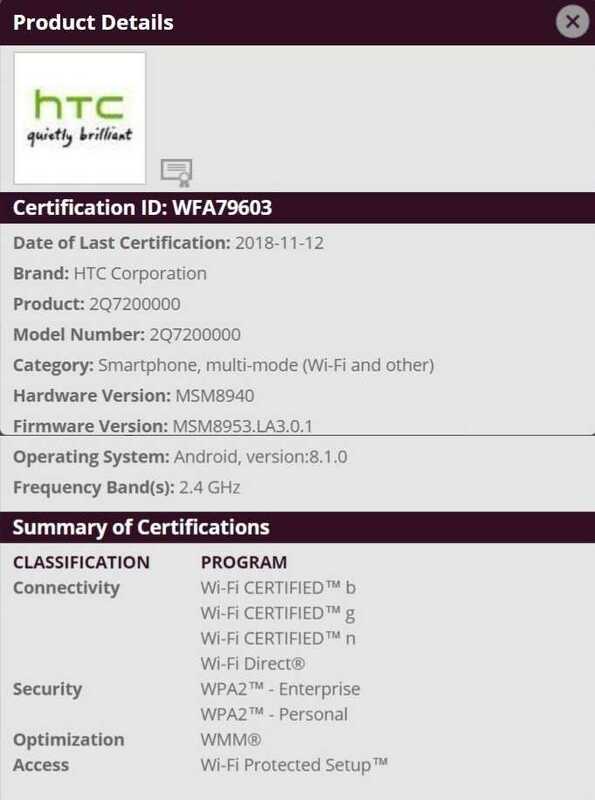 A new HTC phone has been spotted on Wi-Fi Alliance. The handset has a model number of 2Q72000. It is the very same model number that had surfaced through its Bluetooth SIG listing in the previous week. The HTC 2Q72000 WFA listing reveals that it is loaded with Android 8.1 Oreo OS and it is equipped with support for Wi-Fi 802.11 b/g/n. Nothing much is known about the specifications of the HTC 2Q72000. Its Bluetooth SIG listing had revealed that it supports Bluetooth 4.2 and it is fueled by Snapdragon 435. The same processor is also mentioned on the WFA listing. The mentioning of msm8953 near firmware version suggests that it could be fueled by Snapdragon 625. If the company releases this smartphone, it would be launching as its first smartphone with the older and modest Snapdragon 435 SoC. The chipset features a quad-core processor that work at 1.4 GHz. The SoC also includes Adreno 505 graphics. HTC has mainly concentrated on releasing flagship and high-end phones in 2019. There is no information available on the other specs and pricing of the smartphone. Probably, it may arrive with an 18:9 aspect ratio supporting smartphone. The SoC could be equipped with 3 GB of RAM. It may arrive in 32 GB or 64 GB storage model.. The Taiwanese tech company has launched only 6 smartphones this year. Among them, the HTC U12+ is a flagship phone while the Desire 12 and Desire 12+ are mid-range phones. The other HTC phones that have launched this year include HTC U12 Life, U11 Eyes and Exodus 1. The HTC Exodus 1 is the first blockchain phone from a well-known smartphone manufacturer. The handset has been already announced and it is slated to release in the U.S. in the coming month. There is no information on the launch date of the HTC 2Q72XXX phone. There is a possibility that that the company may announce it before the end of the year 2018.